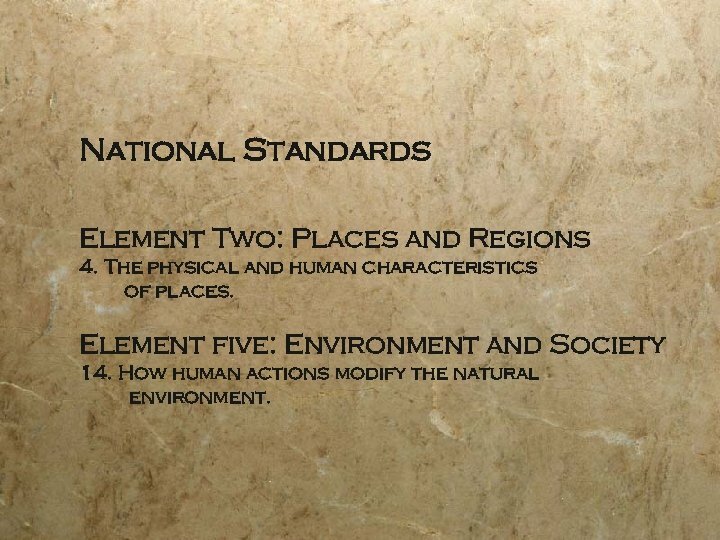 National Standards Element Two: Places and Regions 4. The physical and human characteristics of places. Element five: Environment and Society 14. 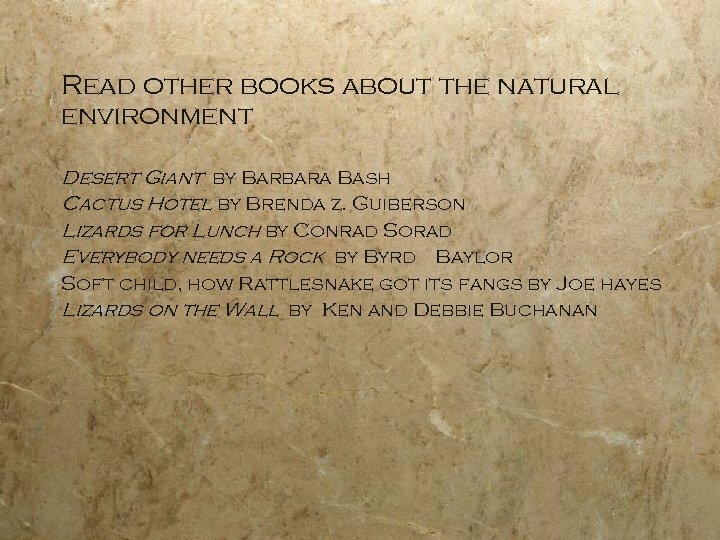 How human actions modify the natural environment. 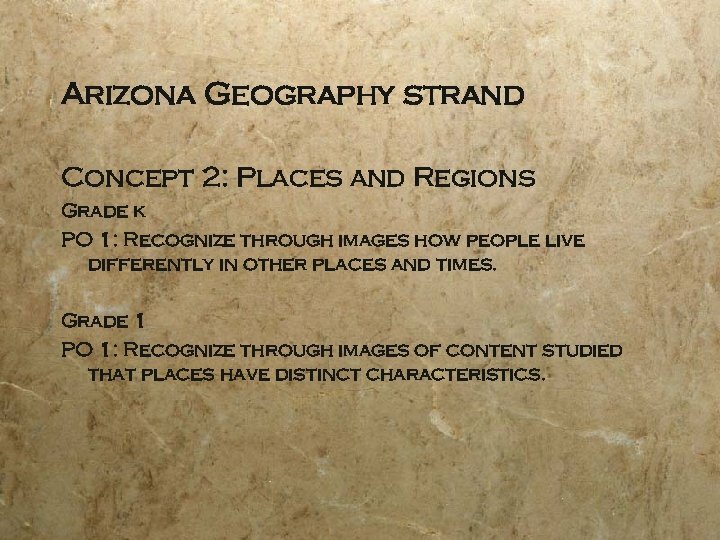 Arizona Geography strand Concept 2: Places and Regions Grade k PO 1: Recognize through images how people live differently in other places and times. Grade 1 PO 1: Recognize through images of content studied that places have distinct characteristics. 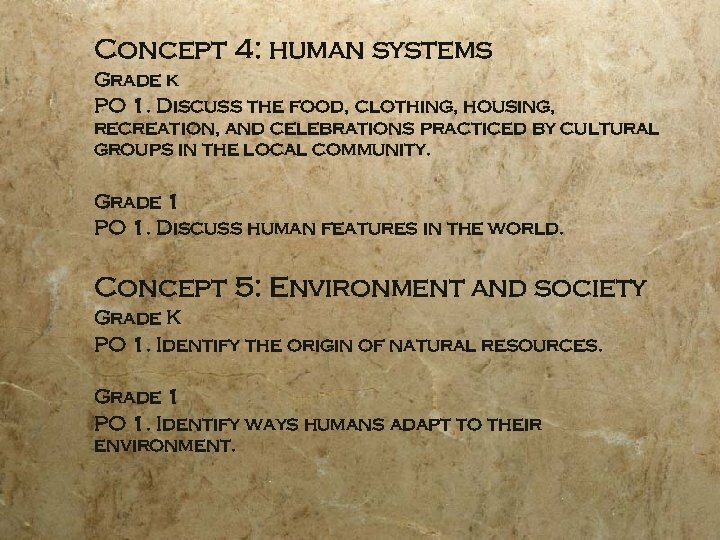 Concept 4: human systems Grade k PO 1. Discuss the food, clothing, housing, recreation, and celebrations practiced by cultural groups in the local community. Grade 1 PO 1. Discuss human features in the world. 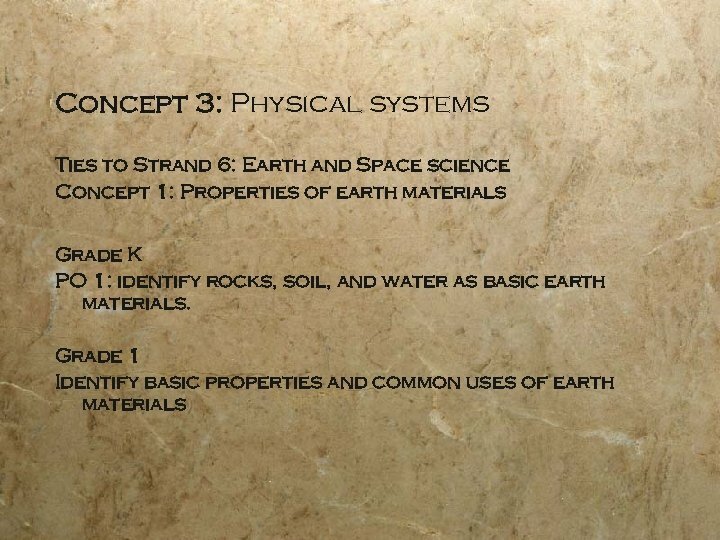 Concept 5: Environment and society Grade K PO 1. Identify the origin of natural resources. Grade 1 PO 1. Identify ways humans adapt to their environment. 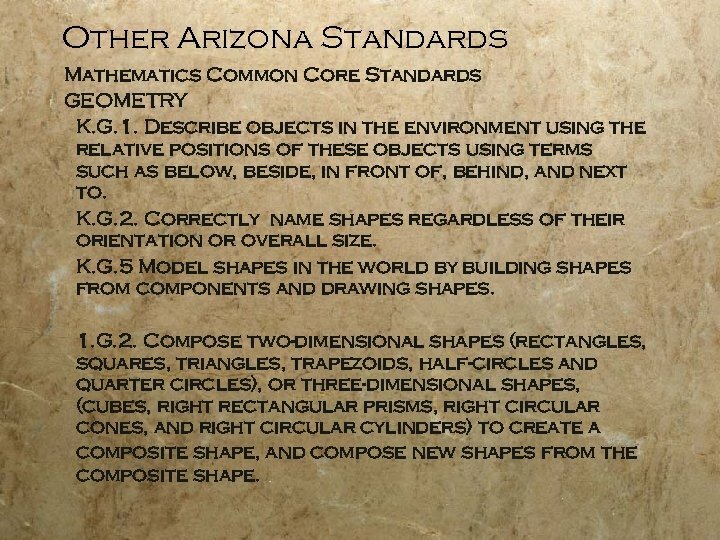 Other Arizona Standards Mathematics Common Core Standards GEOMETRY K. G. 1. Describe objects in the environment using the relative positions of these objects using terms such as below, beside, in front of, behind, and next to. K. G. 2. Correctly name shapes regardless of their orientation or overall size. K. G. 5 Model shapes in the world by building shapes from components and drawing shapes. 1. G. 2. Compose two-dimensional shapes (rectangles, squares, triangles, trapezoids, half-circles and quarter circles), or three-dimensional shapes, (cubes, right rectangular prisms, right circular cones, and right circular cylinders) to create a composite shape, and compose new shapes from the composite shape. 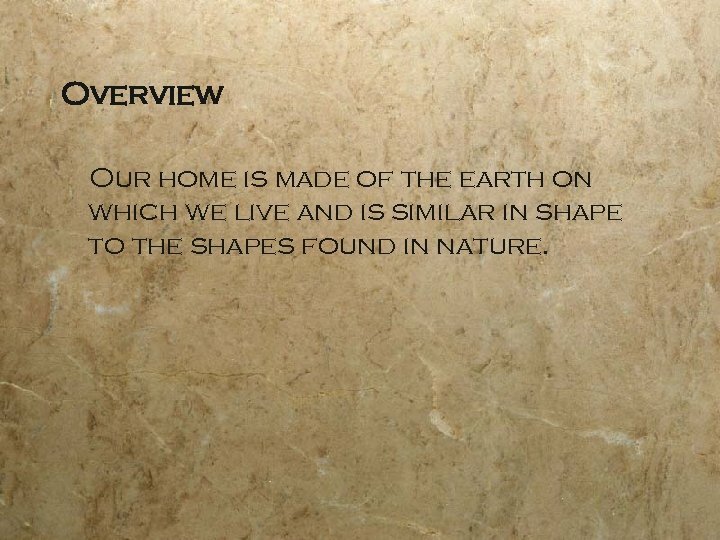 Overview Our home is made of the earth on which we live and is similar in shape to the shapes found in nature. 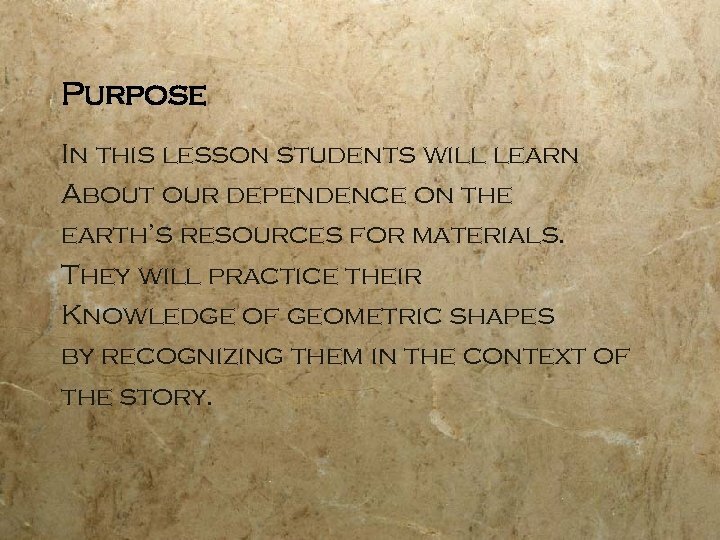 Purpose In this lesson students will learn About our dependence on the earth’s resources for materials. They will practice their Knowledge of geometric shapes by recognizing them in the context of the story. 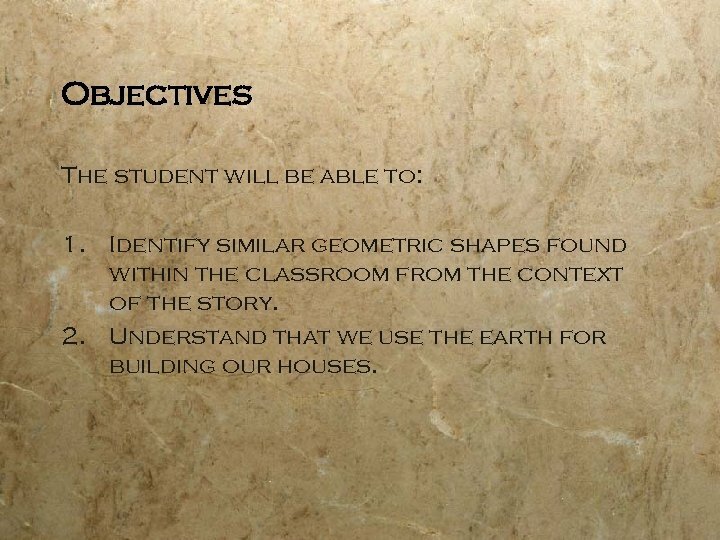 Objectives The student will be able to: 1. Identify similar geometric shapes found within the classroom from the context of the story. 2. Understand that we use the earth for building our houses. Procedures Prerequisite skills. Geometric shape names. 1. 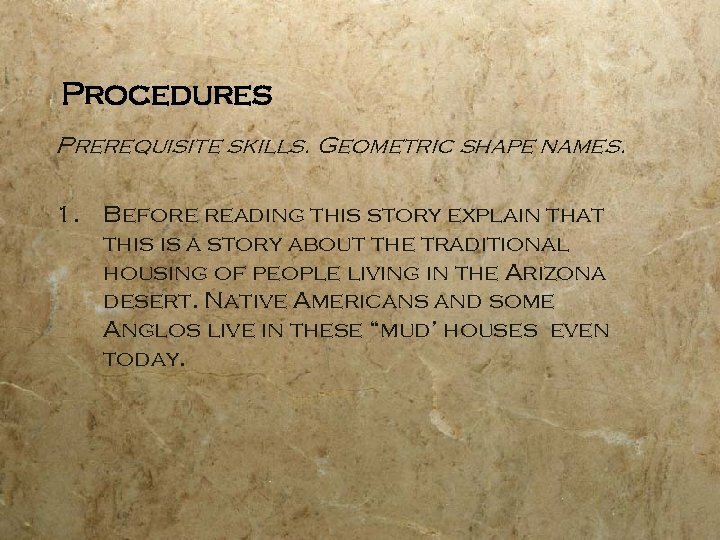 Before reading this story explain that this is a story about the traditional housing of people living in the Arizona desert. 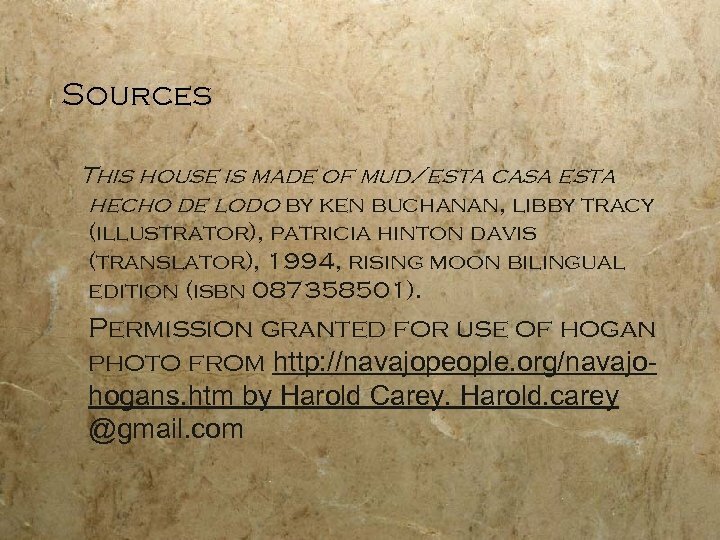 Native Americans and some Anglos live in these “mud’ houses even today. 2. 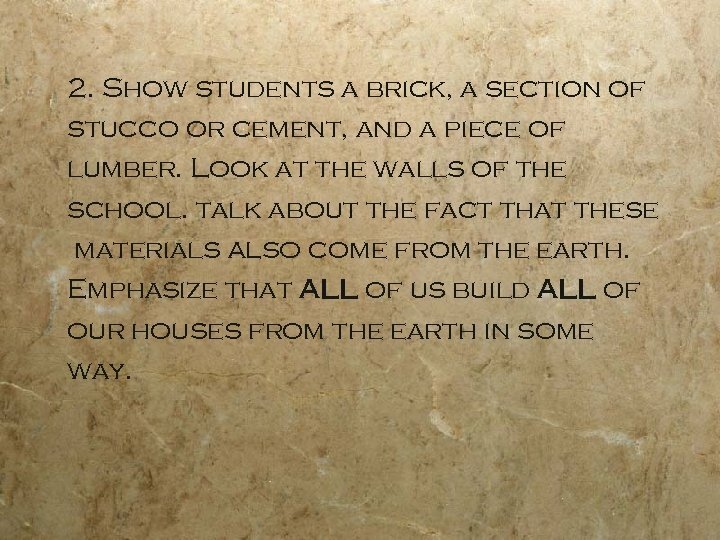 Show students a brick, a section of stucco or cement, and a piece of lumber. Look at the walls of the school. talk about the fact that these materials ALSO come from the earth. Emphasize that ALL of us build ALL of our houses from the earth in some way. 3. 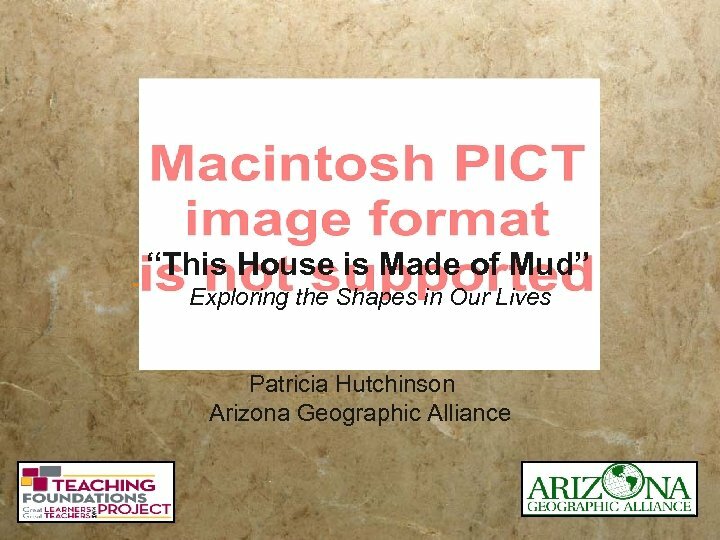 Read the book this house is made of mud to the class. 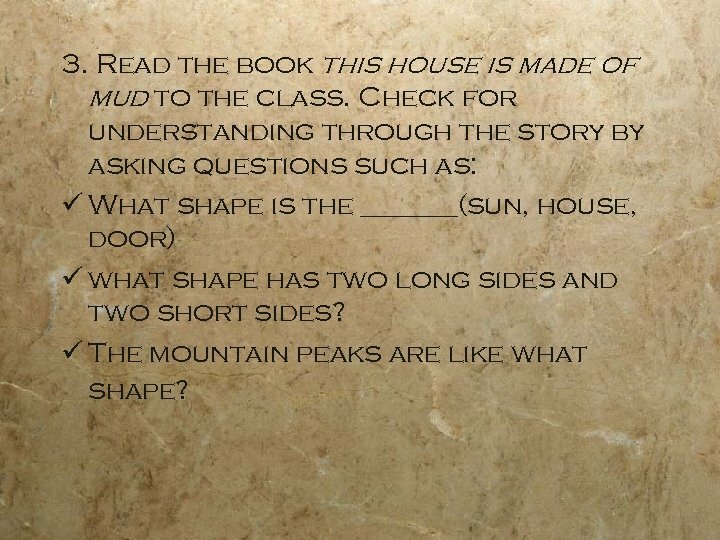 Check for understanding through the story by asking questions such as: ü What shape is the _______(sun, house, door) ü what shape has two long sides and two short sides? ü The mountain peaks are like what shape? 4. 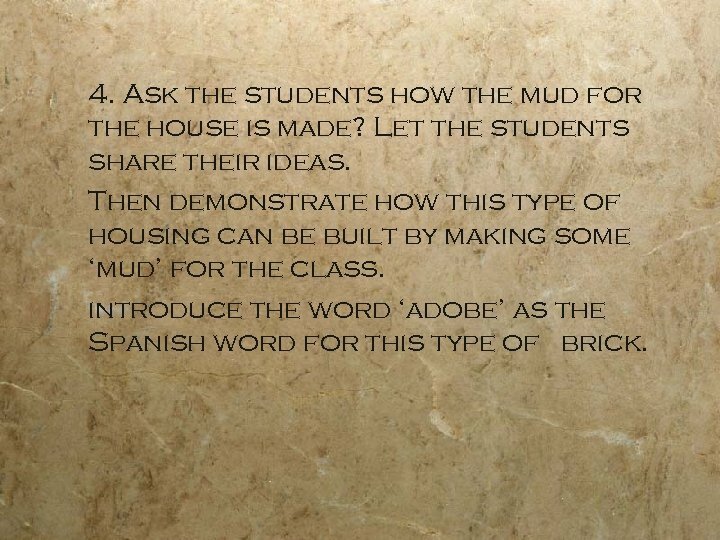 Ask the students how the mud for the house is made? Let the students share their ideas. 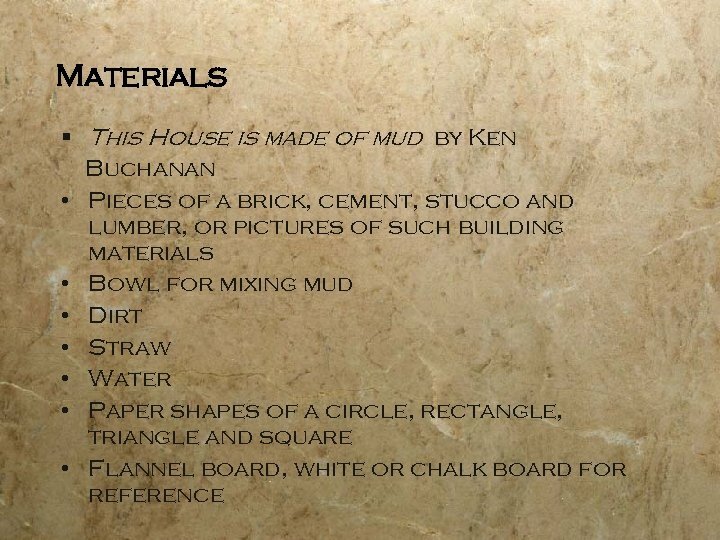 Then demonstrate how this type of housing can be built by making some ‘mud’ for the class. introduce the word ‘adobe’ as the Spanish word for this type of brick. 5. 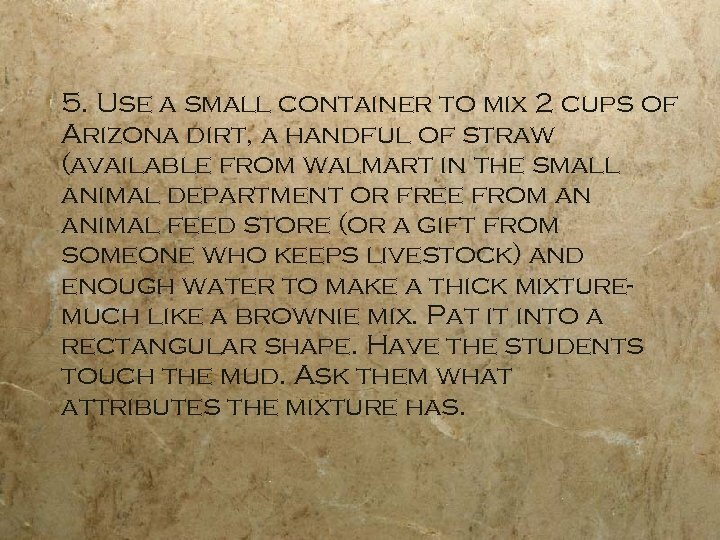 Use a small container to mix 2 cups of Arizona dirt, a handful of straw (available from walmart in the small animal department or free from an animal feed store (or a gift from someone who keeps livestock) and enough water to make a thick mixturemuch like a brownie mix. Pat it into a rectangular shape. Have the students touch the mud. Ask them what attributes the mixture has. Assessment Math 1. 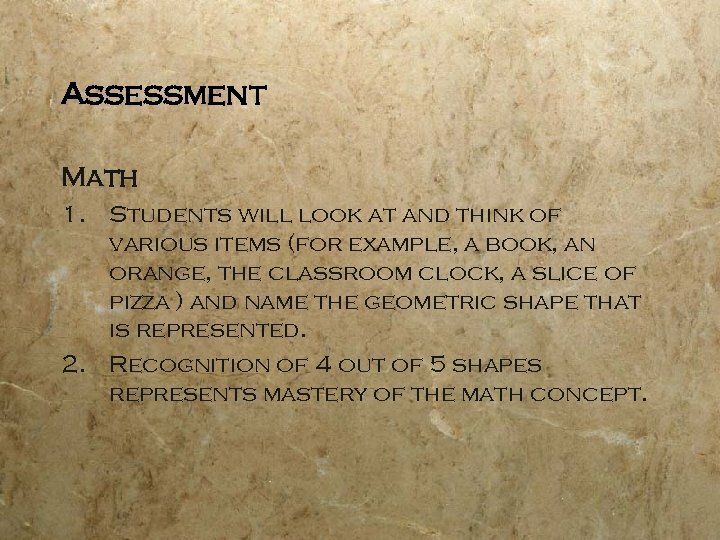 Students will look at and think of various items (for example, a book, an orange, the classroom clock, a slice of pizza ) and name the geometric shape that is represented. 2. Recognition of 4 out of 5 shapes represents mastery of the math concept. 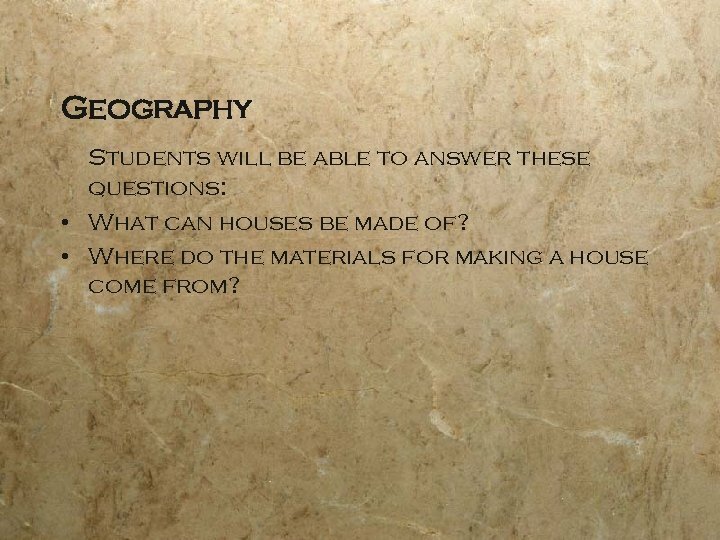 Geography Students will be able to answer these questions: • What can houses be made of? • Where do the materials for making a house come from? 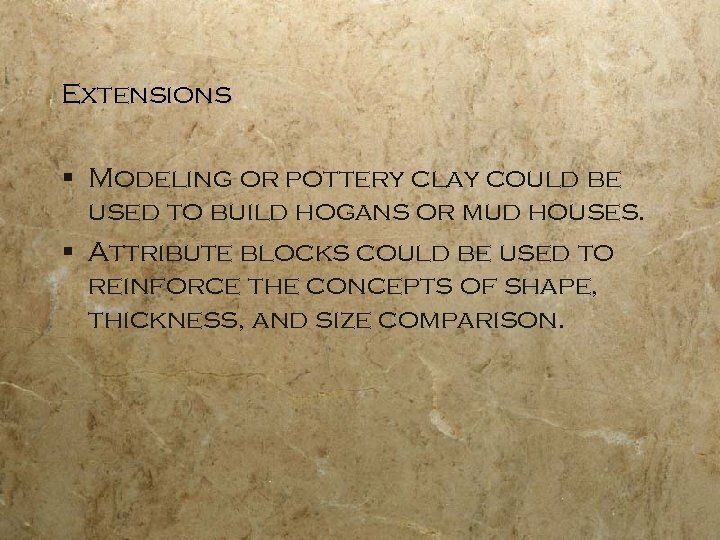 Extensions § Modeling or pottery clay could be used to build hogans or mud houses. § Attribute blocks could be used to reinforce the concepts of shape, thickness, and size comparison. 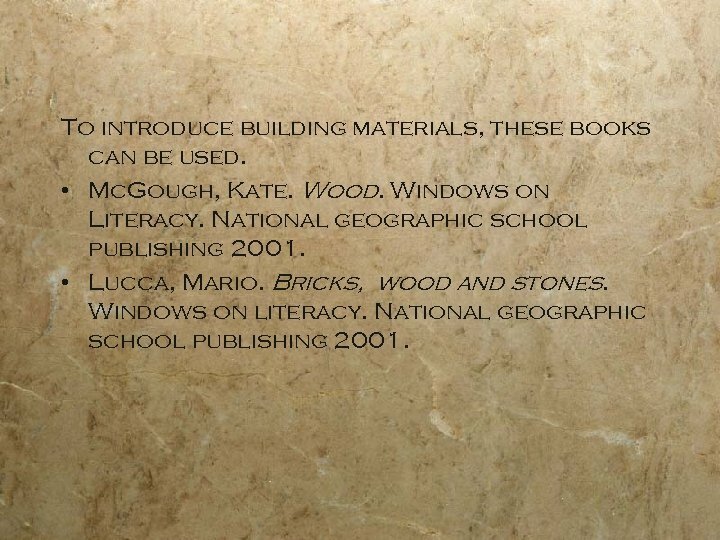 To introduce building materials, these books can be used. • Mc. Gough, Kate. Wood. Windows on Literacy. National geographic school publishing 2001. • Lucca, Mario. Bricks, wood and stones. Windows on literacy. National geographic school publishing 2001.